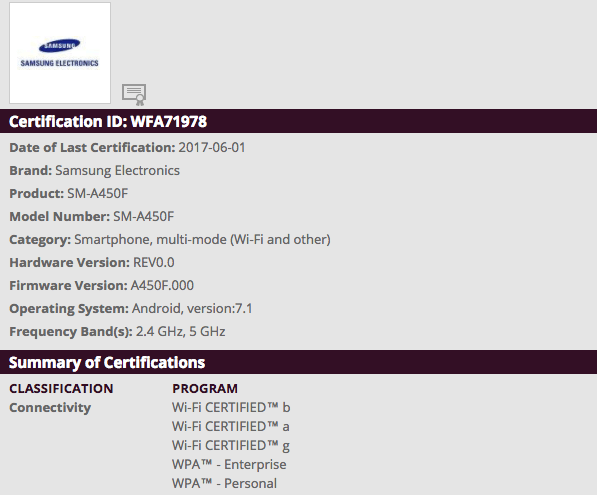 A new, mysterious Samsung smartphone has received WiFi certification from the WiFi Alliance (WFA). As is usually the case, the WiFi listing for the device doesn't reveal much, except that it carries a model number of SM-A450F and runs Android Nougat version 7.1. Details may be scarce at the moment, but given that the Samsung SM-A450F has started collecting necessary certifications, we expect to hear more about the device sooner rather than later. Maybe the secret weapon in Alfred Hitchcock's newest film.